i've never been much for brownbagging a lunch to work, partly because i like to my meals to be somewhat spontaneous. and partly because i'm always rushing out the door in the morning and don't have time to search for and pack the various items that go into said brown bag. i usually put off deciding on what to eat until right around lunchtime. so what will it be, chinese or thai? a sandwich or pizza? or something that involves walking to a nearby food truck or coffeehouse? should i get something light or something that'll leave me in a food coma all afternoon? not knowing what i'll eat until i actually scout out and purchase it makes my lunch routine somewhat more adventurous. unless, of course, when i'm on a set schedule of raw veggies for lunch and already have a fridge full of those veggies at home. 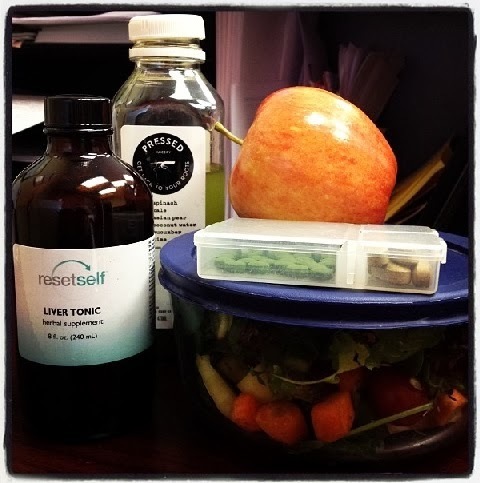 plus i had to remember bring along the cleanse tonic so i could take the prescribed doses when i needed to. so right before i ran out the door this morning, i grabbed a vegetable juice, apple, and multivitamin for breakfast, the liver tonic, and the salad and chlorella tablets for lunch. then dashed out the door. it was only when i arrived at work that i realized i'd forgotten the salad dressing that went with the salad. argh. after mentally running up and down the street, trying to figure out where i could get a fat-free, sugar-free, salt-free, dairy-free, preservative-free serving of dressing from the restaurants around me, i ended up calling one of the acupuncturists whose shift started later that afternoon. luckily, her fridge is stocked with that exact kind of dressing, so she said that she'd gladly bring a bottle when she came in. problem solved. one o'clock rolled around and my belly reminded me that it wanted lunch. but the dressing wasn't coming in until two hours later. what now? i ended up running to the mediterranean place down the block to get a half order of hummus and ate it with half of my salad, intending to eat the other half when the dressing showed up. normally, i'd relish the warm pita bread that comes with the hummus. but because i'm not allowed to eat anything bread-like, i had to give it away; sadly, no one wanted it. it pained me to have to throw away perfectly good food, but at least i'll know to have them hold it until i'm off the cleanse. two weeks, i keep telling myself. by the way, as a follow up to yesterday, i did take my liver tonic when i was supposed to - a couple of hours before lunch, and a couple after. at least i got it right this time!